Not often do you get the chance to take a look behind the scenes of someones business and learn their trade secrets but now you can. 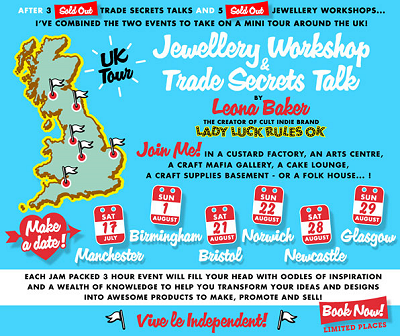 Leona Baker, the creator of cult indie jewellery brand Lady Luck Rules OK has been running Jewellery Workshops & Trade Secret Talk events in London and is now taking her popular worshops on the road. The Trade Secret Talk will cover topics such as how to start, run & grow an independent creative business; how to successfully sell online; PR, marketing and social media; wholesale & trade shows; and how to deal with the tough stuff like competitors and copycats! The Jewellery Workshop reveals all their unique production methods & materials, the importance of sampling, working with manufacturers, where to source and practical tips on how to achieve the best results. The techniques involved can also be applied to many other products including accessories, clothing, home wares, greetings cards and stationery. The initial London talks and workshops have been attended by a wide variety of people from artists, graphic designers & illustrators, boutique owners, jewellery designer/makers and include a Central St Martins Design Tutor and attendees who’ve travelled from Paris and Italy. There are 6 worshops around the UK so everyone has the chance to attend one close by. As a jewellery designer-maker and jewellery supply seller I've already booked my ticket to attend the Birmingham workshop on Sun 1st August. If you're going to be there leave a comment, it would be great to meet up. Ooh! I was going to the Birmingham one alone, so I would love to meet you there! Great, pleased there will be a familiar face. Last saw you at Handmade in Oxford some time ago now. See you there. in this u will surely find out some important tips to be healthy.